Caption slip reads: "For Sunday or Monday. Photographer: Emery. Date: 1952-04-16. Reporter: Phister. Assignment: Baby born after father killed in Korea. 88-89-50-51-52-53: At home, 323 Janice Street, Long Beach. 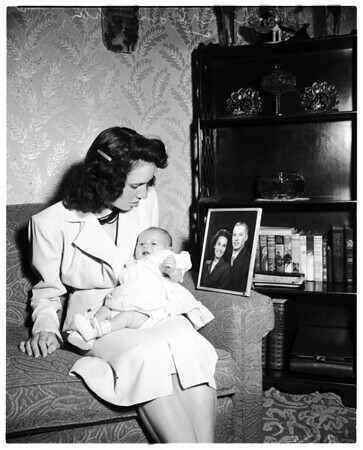 Mother Mrs. Cloteilda (correct) Ehle, 19 years and baby daughter Ginger Myrlene Ehle (with photo of parents together). 031: Copy photo of parents. 032: Cloteilda and Myrle Ehle".